This map illustrates satellite-detected flooded areas over the Viêt Tri in Phu Tho Province of Vietnam subsequent to Typhoon Rammsun which made landfall in Vietnam on 18 July 2014. 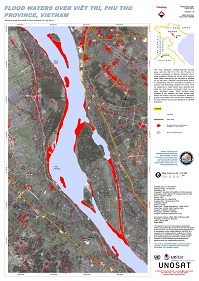 Using a radar image collected by the TerraSAR-X satellite on 19 July 2014, UNOSAT analyzed flood waters in collaboration with the Vietnamese Academy of Science and Technology. Despite the heavy rains no evidences of major floods were detected and while the river seems overloaded there are no large inundated areas. Small flooded areas detected in this analysis are likely normal after heavy rain events and are expected to dissipate quickly. This analysis has not yet been validated in the field. Please send ground feedback to UNITAR /UNOSAT.